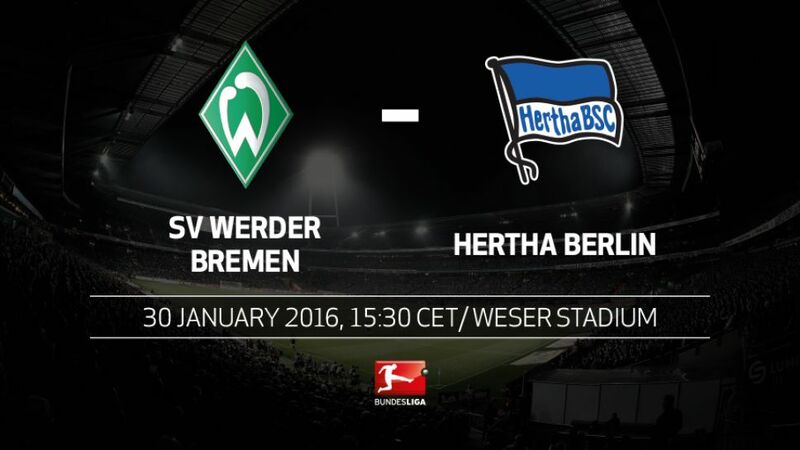 SV Werder Bremen will put their survival bid to the test against UEFA Champions League candidates Hertha Berlin on Saturday afternoon (kick-off: 15:30CET/14:30GMT). The Green-Whites picked up a much-needed win away to FC Schalke 04 last time out but still occupy the relegation play-off spot. Third-placed Hertha, meanwhile, extended their lead over fourth-in-the-table Borussia Mönchengladbach to four points, despite being held to a 0-0 draw by FC Augsburg after the Foals lost 3-1 to Borussia Dortmund on Matchday 18. Both goals came in the first half as Bremen held Hertha to a 1-1 draw back in August. Valentin Stocker scored early, but the hosts' lead lasted just 20 minutes, with Nigeria international Anthony Ujah scoring his first Bundesliga goal in a Bremen shirt to level. Hertha have amassed a league-high 10 points from the last 12 on offer. They have only lost one of their last eight - against FC Bayern München on Matchday 14.Bremen's home form is the worst in the division (W1, D1, L6).Pal Dardai will take charge of his 34th game as Hertha head coach against Bremen. He has already accumulated 50 points; 53 would be a new Hertha best mark for that period of time.On average, Hertha have conceded less than a goal per game under Dardai: a club best-mark.Werder have won their last seven home games against Hertha, who have not won in Bremen in almost ten years (March 2006).Victory against Bremen will take Hertha onto 36 points. They finished 2014/15 with 35.This season's oldest Bundesliga goalscorers - Claudio Pizarro and Clemens Fritz - both play for Bremen.Fritz has had a say in five of Werder's last six goals (one goal, four assists).Bremen have conceded at least once in each of their last 22 Bundesliga games.